At Acorn Consulting, our approach to wealth management is built on the holistic philosophy that your wealth should be aligned to enable your life—not the other way around. As an independent wealth management firm, we'll work with you to discover how you can use your wealth to achieve greater fulfillment, security, and integrity—both today and in the future. We'll take the time to examine not only your financial goals, but also your dreams and desires. We then will create a wealth management plan that integrates your financial resources with your life objectives. The result is not a single, rigid solution, but rather a vital and ongoing process that places your wealth at the service of your life. We call this "financial wellness." Discover: Includes clarifying your goals, challenging your investment assumptions, and organizing your goals by time frame and priority. Assess: We'll build a context around each of your goals and begin to develop your path toward financial wellness, and we'll provide clarity about your risks and opportunities. Evaluate Options: We'll present a variety of scenarios that address your financial needs and your life desires, and we'll walk you through the impact each scenario will have on how you live your life. You then can choose the options that are the best fit for you and your lifestyle. Implement: Working in a disciplined environment, we'll put your plan into action, always ensuring that the elements of your program remain consistent with your life goals. Manage Change: Change is an inevitable part of life. When it does happen, we'll be here to help with the unexpected, recommend appropriate solutions, and continue to help you maintain financial wellness. Comprehensive financial planning to help build a realistic approach to your financial goals based on your personal goals and objectives. 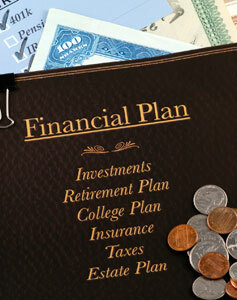 Family wealth planning to create financial stability and help support your life dreams and desires. Retirement income & distribution planning to help make sure the money is there when you need it considering current and potential income, spending patterns, inflation, and tax-effective distribution strategies. Cash-flow planning to help you stick to your long-term plan and simplify the process of managing your wealth. Estate & trust services to help protect your legacy by planning for the most efficient transfer and distribution of your assets.